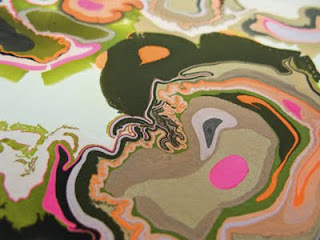 Copenhagen designer pernille snedker hansen of snedkerstudio is using an old and almost forgotten technique of marbling, which here interacts with the scandinavian tradition of pine wood surface treatments to create an unusual, slightly psychedelic effect. The marbling patterns are the result of color freely floated on either plain water or a viscous solution and then carefully transferred to the absorbent wood surface. 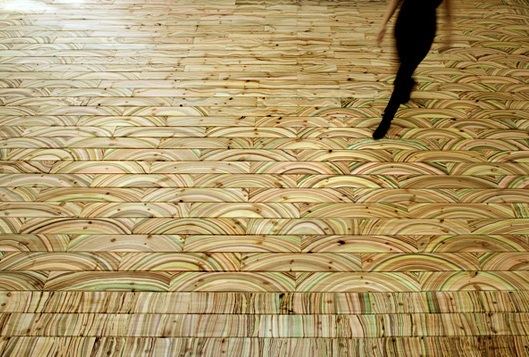 The pattern reflects the growth ring patterns in the natural wood. The wooden planks are made one by one, and thus each floor board acquires a unique pattern of colored stripes. The marbelous wood collection has been created to vitalize a simple pinewood floor and turn it into a powerful visual experience.